We are now in the third game of a tough four game schedule, when we meet Chelsea tomorrow afternoon at home, and we lost the first two games at Sunderland and to a Manchester City second eleven on Wednesday night in the Capital One Cup. Alan Pardew is trying to remain positive after two poor results, although the team played quite well in both the previous two games, but we missed our chances, and that will nearly always count against you. If Newcastle are going to get anything out of this game tomorrow, we will need to defend at or near our very best, and take any chances that we get, but we have Fab Coloccini, Steven Taylor and Paul Dummett out injured. But in all honesty, looking at this game, it’s very difficult to see how Newcastle can come out on top and actually win the game, and given the poor spirits our fans are in at the moment, a win is really what we need right now. But we suppose we can take some solace out of the fact that we won this same game last season 3-2. Does lightning strike twice at SJP ? More to the point does Cisse ? We will be lucky to just lose – we could be given an absolute shafting if we dont start off flat out and attack them. It will need every ounce of the managers tactical accumen to get anything out of this game!! For me the sad thing the whole season is so inevitable ive just stoped caring. Untill MA goes there will only ever be the bottom of the barrrel shite he peddles. We are a cheap advert for his tacky shops,hope he f^fks off to Scotland and buys Rangers. Other than the first half against Liverpool, away at Cardiff and the second half against Everton it has been same old same old . 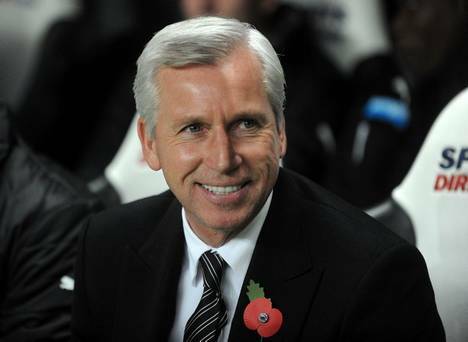 Who does Pardew think he is kidding ? . Nobody cars what he has to say,not even the players. Wolfs – he was trying to emulate Ibiza’s “Manly Pose” but failed, miserably!! The alternative, causing the shadow, just doesn’t bear thinking about, given him and Ash are bossom buddies!!!! If you have a quesy tummy, DO NOT read this post!! I definitely think we can turn over Chelsea at St James’, who are a nice football team and so give you a chance. Also think we have a chance against Spuds, who would struggle to hit a cows arse with the proverbial banjo at the mo, fortunately for us, considering our at times hapless defense. Then again it is the hope that kills you. Aww, Fug that, pathetic navel gazing. C’mon lads! Haway, man! That was one of the best football games at SJP I had been at in awhile at the same fixture last season, and funnily enough even though we lost 0-3 the best I seen us play the season before that, but unfortunately I have lost all interest in watching them in our famous stadium. Despite the doom and gloom this season, you have to give credit to the lad Dummett to now be mentioned as one of our starters. I really see him setting the example for the academy (barring a stupendous fee from liverpool) and hope Campbell, Streete and Armstrong follow his path. I hate this pathetic spiel before every match! He’s so incredibly defeatist- just like before man city he was telling us about how we can’t compete against the squad strength of the likes of City and Chelsea. Then he talks about how every side is a very good side which we need to be at our best to beat. It hardly instills confidence does it? Sadly this team coming to St James has REAL world class players. Loving the optimism Alan, but it is going to take something very special to get something out of this game today. Atleast with NUFC you just never know. Always a glimmer of hope. Even if the odds have been stacked against you from your own boardroom. Howay the TOON. Get yourselfs out fighting today. Book to their youngster and use the character to reinforce the healthy option. The line the Gruffalo has taken and eaten all( the sugar filled )honey puffs/ pops) you could even introduce it into your bedtime story to reinforce it. It will work wonders. The Gruffalo Book’s by Julia Donaldson and Villads will love it. You can donate my fee to a dog charity.